WHERE IS THE VIPER 640 MADE? The Viper is built by Rondar Raceboats in their Wiltshire, UK production facility. CAN THE VIPER BE LAUNCHED ON A SLIPWAY OR RAMP? Yes, it can be easily launched off the trailer. You need about two feet (0.6 m) depth of water for it to float off. It is also just as easy to recover. CAN THE BOAT BE TOWED BY A FAMILY CAR? Yes, most reasonably sized cars can tow the Viper on its Rondar built trailer. IS IT SIMPLE TO RIG? Yes, it can usually be rigged in under 40 minutes. The mast can be lowered or raised by two people, either by hand or using the spinnaker halyard. HOW DO I RAISE OR LOWER THE KEEL? The Viper is the easiest and safest keel system to raise and lower in the category of smaller sports boats. There is no need for cranes or special tools. The keel is raised and lowered by a simple 6:1 tackle attached to the mast. It is guided precisely into place by two wedges on the side of the keel. When sailing the lifting tackle is stowed in one of the Viper’s two convenient lockers. In the unfortunate event of running aground, the wedges and sacrificial components of the keel cassette absorb most of the impact before the hull is damaged. CAN THE BOAT BE LIFTED USING SINGLE POINT LIFT OR CRANE? Yes, it has lifting places for a quick crane lift when required. IS THE VIPER EASY TO SAIL? Yes, with the extra stability from the keel and simple layout, the Viper is comfortable and has a large, well laid out cockpit with no heavy loads–perfect for the family or racing! Today in the U.S., there are Viper regattas sailed solely by women and juniors. HOW MANY CREW ARE NEEDED TO SAIL THE VIPER? The Viper is primarily raced by three in Grand Prix events. It is easily handled by two and often raced locally by two. It has a cockpit large enough to accommodate four, possibly five juniors or smaller sailors. The ideal racing weight is 500-600 lbs. CAN I SAIL A VIPER IN HANDICAP RACING? Yes – the Viper has an IRC rating, PHRF and a Portsmouth Yardstick handicap number so you can choose to race against dinghies or keel boats, click HERE to find out more. CAN I CAPSIZE A VIPER? Yes, you can capsize a Viper, particularly if the boat comes out of a gybe at too hot of an angle on windy days. That said, the combination of carbon mast and 220 lb. (100 kg) keel bulb ensures that the Viper is as stable as possible. In fact, the Viper 640 passes the stringent “self-righting” test in the European Recreational Craft Directive and the international stability and buoyancy standard ISO 12217. Like all sport boats, it can get knocked down in a bad broach, but the 262 lb. (119 kg) overall weight of the keel (bulb and blade) enables an easy recovery. The Viper is fast, exciting and responsive to weight, but with a speedy, stable platform–both upwind and down–it is easy for sailors with a wide range of abilities to sail a Viper well. IS THE MAST TWO PIECE? Yes, the two-piece carbon mast allows for ease of winter stowage or overseas shipping. ARE THE CLASS RULES IN PLACE? Yes, this is a strict one-design with comprehensive rules. Because the Viper 640 Class Association is a member-owned organization, members may recommend modifications to the Class Rules that are subsequently voted upon by Viper Class members. This keeps the Class Rules fresh, relevant, and current. To read them, click HERE. HOW MANY BOATS ARE THERE WORLDWIDE? WHAT IS THE REGATTA CIRCUIT BEING PLANNED? The USA has a Pacific Coast circuit, an Atlantic Coast Circuit, a Gulf Coast Circuit, a Great Lakes/Canadian circuit and a winter series based in Sarasota Florida. Australia has two regatta circuits, one on the West Coast and one on the East Coast. The United Kingdom has a full program of events scheduled for 2019 and beyond. International events include the Viper World Championship (Long Beach, CA, U.S., August, 2019), the Pan American Championship hosted each year in March in Miami, the Euro Cup hosted alternate years on Lake Garda and a full circuit of Australian regattas. 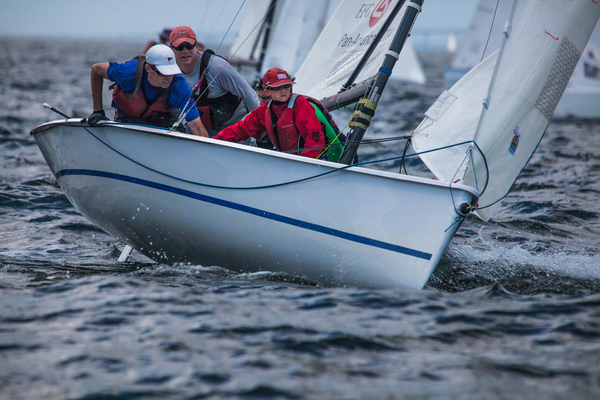 See the full Viper 640 Regatta Schedule HERE. IS THE BOAT FITTED WITH QUALITY EQUIPMENT? Yes, all the best equipment from Harken, Class-approved sailmakers, etc. Everything! You get the yacht complete with all equipment to race or cruise, the sails, and a road trailer. With World Sailing recongnition, Vipers are being shipped globally. Contact Class Leaders, Find a demo boat or contact the builder for new sales. Easy to get sailing and up to speed, yet all the one design competition you can handle. © 2019 Viper 640 Class Association. Viper 640 and the Class logo are registered trademarks.